The shortlist is out and Vancouver has made the cut! If we get enough votes, we’ll be a destination airfield. 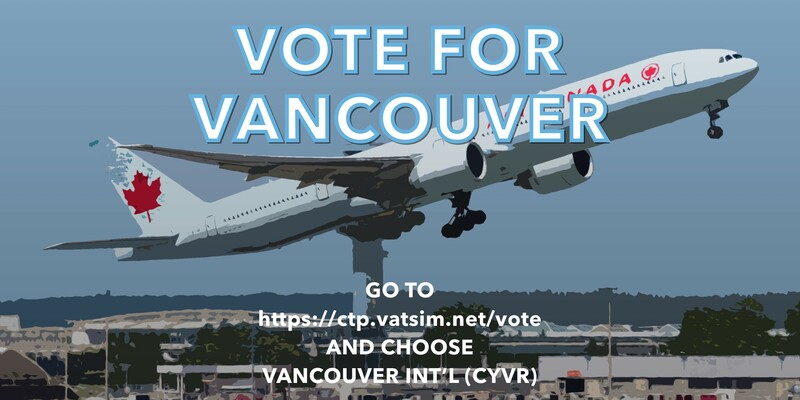 Please take a moment to vote for CYVR at https://ctp.vatsim.net/. Log in and click ‘vote’. Cross the Pond Westbound is scheduled for March 30, 2019 from 1100z - 2300z. Even though a lot of details are not sorted out enough yet to create a schedule, it would be good to know who is available during the event. We can expect traffic starting around 11am - noon Pacific and ongoing for about 5 or 6 hours steady. So if you are around on the 30th and want to help out in this event please reply below with your availability range and current rated position. There will not be any position move ups for training during this event. I should be available for as long as needed. S2. I will be available from around 1900z to 0600z. S2 now. Should be mostly available 1100z and 2400z. S1, but deep into training S2. Had a refresher recently, cleared for DEL by Brad, but hopefully will be able to control even for a while in CTP level traffic. I'll be available for whole event or as required as I already mentioned. Just wanted to post for assurance! If the plane takes off again it was a good landing.